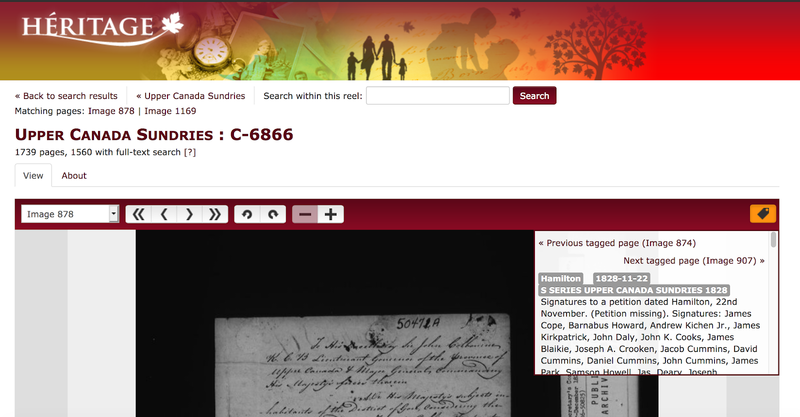 As of January 1, 2019, all Canadiana content included in Early Canadiana Online, Héritage, and Canadiana Online became available at no charge to users. For those uncertain how to use the site, here's a walk-through which I hope will help. 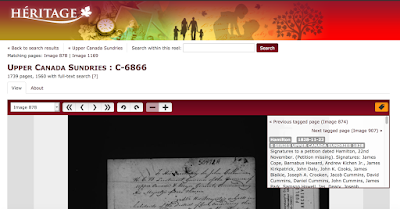 A new page opened showing that there are 2 results in Upper Canada Sundries. The text further indicates "Matching pages: Image 878 | Image 1169" Each of the images is clickable. 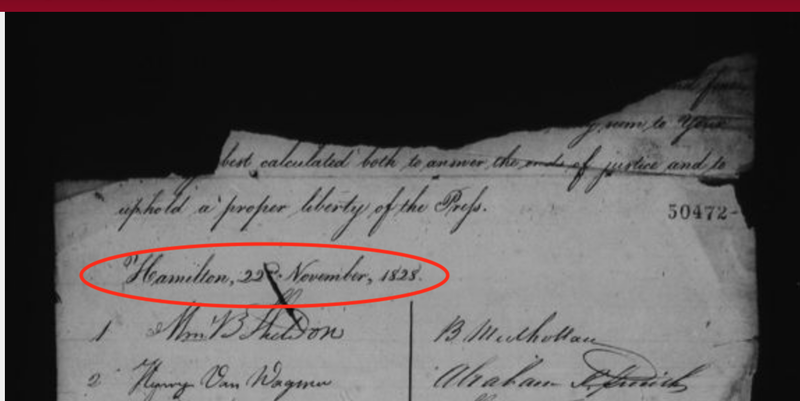 Clicking on these links will take me to the actual image for whatever record for my ancestor is there. The small white pop up on the right explains that this contains signatures to a petition dated Hamilton, 22nd November 1828 but the petition itself is missing. I can copy the text inside the white box, then paste it into a text editor to search for the name I want (Vollick). Then I can come up with an educated guess as to how many images beyond Image 878 I might have to go in order to see the image with the actual written signature of Isaac. Or I can save all the images if I'm interested in who else signed the original petition. 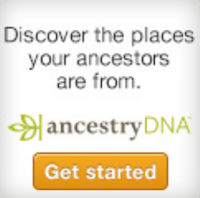 I could have done the same search by choosing Genealogy collection on the main Welcome page. I'd get the same results. Some visitors to the site complained there were no dates, not even a year. That is not correct. For example in the record cited above the date is given in the little popup window. But if that popup window isn't given, you can see that there is no date on the image.